When Motherless Daughters was published 20 years ago, it unleashed a tsunami of healing awareness. 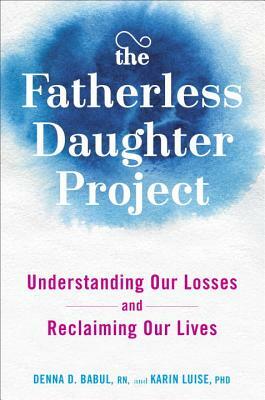 When Denna Babul and Karin Smithson couldn't find the equivalent book for fatherlessness, The Fatherless Daughter Project was born. The book will set fatherless women on the path to growth and fulfillment by helping them to understand how their loss has impacted their lives. Denna D. Babul, R.N., is a successful life coach, Huff Post blogger, motivational speaker, writer, medical expert, and cofounder of the Fatherless Daughter Project. She has been featured on the Today show and Atlanta & Company. A fatherless daughter since the age of thirteen, Babul has found her calling in creating a community and support system for fellow fatherless women of all ages. Her focus is helping others learn how to transform a difficult past into a thriving future. She lives in Atlanta with her husband and two children. Karin Luise, Ph.D., is a counselor, writer, educator, and inspirational speaker specializing in spirituality, women’s issues, and holistic well-being. She is a regular blogger for The Huffington Post and has been featured on HuffPost Live, in USA Today, and in The Atlanta Journal-Constitution. Her passions include helping others find inner peace and life purpose. She resides in Atlanta with her three children and rescue dog, Tucker.